Professional sous kits can cost hundreds, if not thousands of pounds. But it's relatively easy to get started with cheap kit. However, the instructions for how to do it are sparse and confusing. Hence this page. This is a very simple sous vide setup, inspired by Jeff Potter's DIY sous vide description. It uses a slow cooker as the food container and heat source and a temperature controller with a thermocouple to keep things at a stable temperature. A slow cooker. I got a cheap one on sale at the supermarket (under £20.00). Note that it has to be a cheap one, with a mechanical switch, as you'll be switching the power to it. Expensive, digital ones are liable to get confused. A thermocouple. A type J thermocouple for monitoring the temperature. Again, cheap on eBay (£5.00). An extension lead. Buying a four-way extension socket was the cheapest way of getting an electrical plug and socket (about £3.00). An old plastic food containter. You'll have one lying around. It's to keep the controller neat and tidy. Insulation tape and electrical connector. Needed to keep the electrics safe. Microwave-safe, sealable food bags. To put the food in. Make sure they're watertight. The TET 612 has an internal relay, capable of delivering a current of 3A. That's easily sufficient for the 210W slow cooker I have. It means I don't need a separate relay. Check that your slow cooker doesn't draw more than 720W: if it does, you'll need a separate relay. The controller also runs of a 240V mains supply, so no need for a separate power supply. The bad news is that the manual supplied with the controller is very badly translated technical chinese. Luckily, some US homebrewers have the same problem can have found an equivalent controller with a better manual. Based on that, these are the instructions to use. Wiring layout for the simple sous vide controller. Numbered circles are the terminal numbers. Cut out a 30cm section of lead in the extension cord. The section should come out from about in the middle. Remove the outer insulation from this section, separate the wires, and remove about 2cm of insulation from each end of the live (brown) wire. Discard the neutral and earth wires from this section. Remove the outer insulation from about 5cm of each cut end of the extension lead cables and strip about 2cm of inner insulation from each wire. Twist together the live wire from the plug end and one end of the brown connecting wire. Attach these wires to terminal 1 of the controller. Attach the other end of the connecting wire to terminal 13 of the controller. Attach the live wire from the socket cable to terminal 14 of the controller. Twist together the neutral wires from the plug and socket cables. Connect them to terminal 2 of the controller. Use the electrical connector to join the two earth leads. 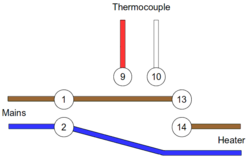 Connect the thermocouple: attach the positive (red) wire to terminal 9, the other lead to terminal 10. Cover all the contacts and connections with insulation tape to stop accidental shorts. You're now ready to set up the controller. Plug it in and the lights should come on! The top numbers on the display should be the current temperature, read by the thermocouple. Use a cup of hot water and a cup of cold water to check that the thermocouple responds to temperature changes. Plug a small lamp into the extension lead to check the relay is working. Use the 'Up' and 'Down' arrow buttons to adjust the target temperature. Once everything's working, place the controller in the plastic food box. Cut a chunk out of the rear of the box to run the cables through. Press set, enter the passcode 0089, and set up the controller parameters as below. The TET 612 is a PID controller and its parameters need to be tuned to control the cooker effectively. The easiest way is for the controller to self-tune by pressing and holding the '>' button until the display flashes. Do it with the slow cooker connected and filled with water that is just below the target temperature. The controller will move the water temperature above and below the target three times, so it could take a few hours to do. Trust the parameters the controller produces. The only one to check is the 'ot' parameter, the output time. This controls how often the relay switches. It should be 20 (seconds) or more, to prevent the relay wearing out too quickly. To examine or manually adjust the parameters, press set and enter the passcode 0036. Should you be interested, these are the parameters I have. Homebrew Talk thread on using the TET 612 controller. Spec page of a TET 612 clone (with a few more features than the TET 612). This page was last edited on 25 September 2011, at 10:52.